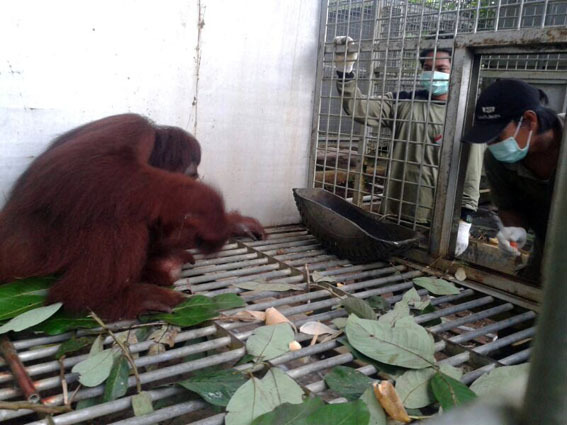 Orangutan Release Day-3: Eighteen Orangutans are Free! What we planned to be a two-day event was extended to the third day because of the weather. That’s how it goes when Mother Nature is the show director. However, as of today, eighteen orangutans are finally free in their rightful home. Fourteen orangutans were released in the first two days and this morning, the last four have also reclaimed their ultimate freedom! Monmon, Bonet, Tehang and Ubai were scheduled to be released on the first day of our release, on August 16. But due to bad weather, they had to stay two nights in the transit enclosures at the compound of PT Indomuro Kencana (IMK). Their turn finally came today. The last four orangutans joined their 14 friends who were released over the past two days, in the Batikap forest. Blessed with sunny weather, the release team in Puruk Cahu started the sedation process at 6 am. 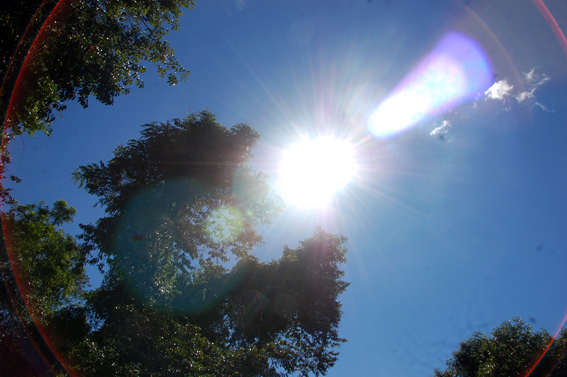 The team in Batikap reported that the weather there was also bright and sunny. It looked like today would be another perfect day to set our orangutan friends free. 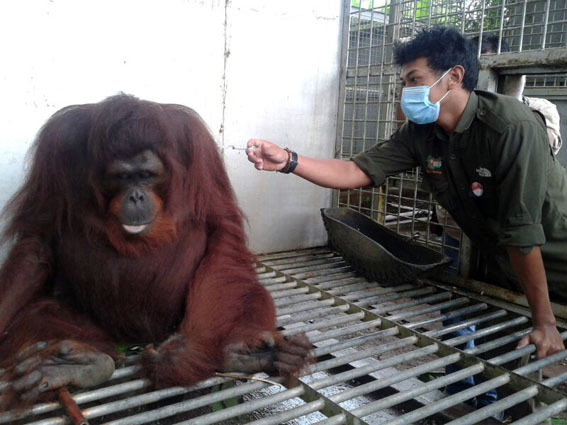 Among the four remaining orangutans, Tehang was the hardest to sedate. An anesthetic dart was successfully administered, but he simply pulled the dart out. Then he grinned mischievously! Technician Tedison had to get into his enclosure and take the dart from him so he didn’t hurt himself with it. Several unsuccessful attempts later, vet Barlian was becoming a little frustrated. Finally, Barlian decided to go into his enclosure and casually chat with Tehang and was able to administer the sedation directly. Done! After waiting for a while, Tehang fell asleep and was gently transferred into his travel cage. 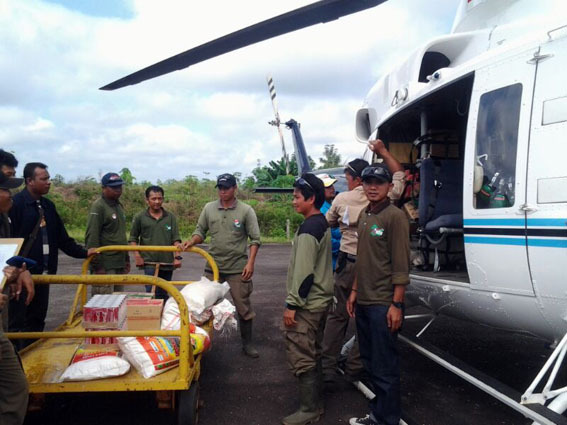 Now all were ready to go to the helipad where the helicopter was waiting to fly them to the forest of Batikap. And at 8 am, Monmon, Bonet, Ubai and Tehang took to the sky heading to their rightful home, heading towards independence and freedom. 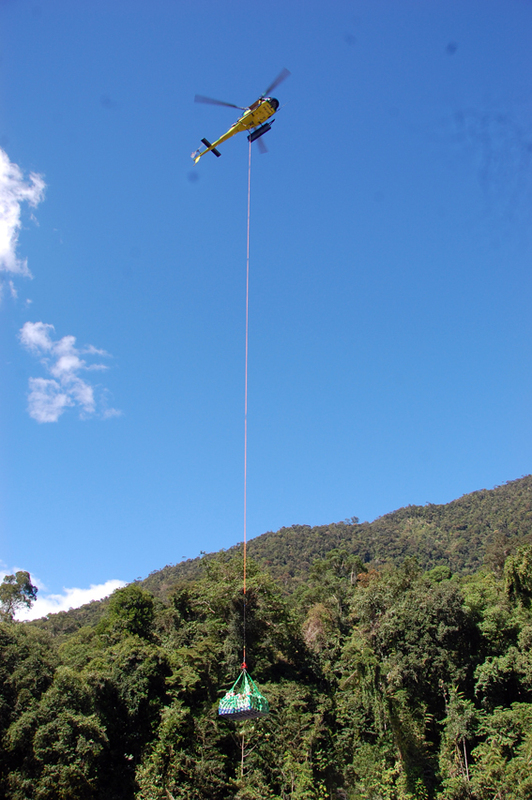 A second helicopter followed a little later carrying all of the much needed logistics and supplies needed by our field team in the forest. 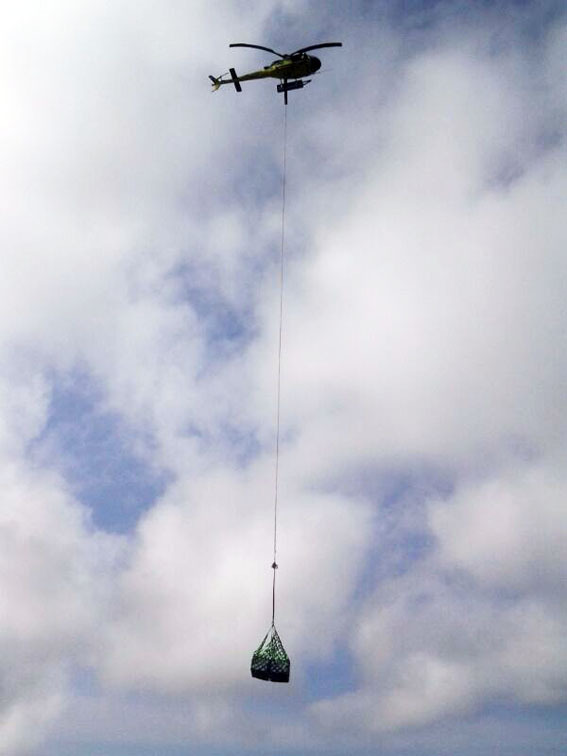 At around 12 pm, the second helicopter dedicated to logistics and passengers very kindly provided by our friends at BHP Billiton, came back to Puruk Cahu. The BOS Foundation Communications Specialist, Paulina Wijanarko, came out of the forest on this flight and brought with her exciting release stories from the second group yesterday. 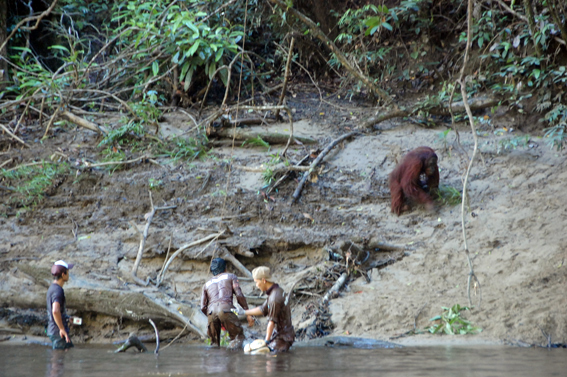 The releases of Lona and her daughter Nielsen, as well as Mongki and Uban, were conducted in a site further than the release site for the previous orangutans. This area needed to be cleared a little bit to facilitate the release process. Therefore, the release team took quite a bit of time to prepare in that sunny afternoon. Fortunately, the preparations went smoothly. Once the release site was ready, Lona got the first turn. Her travel cage was opened by technician Johanis. Getting out of her cage, Lona turned around and looked at the team, then she climbed a tree. But not long after, she came down again and tried to approach the team. The release team successfully encouraged Lona to climb again. But apparently she was just waiting for her daughter Nielsen whose travel cage was right next to hers. So of course Nielsen was the next to be released. Technician Tuwe was the one opening her travel cage. Sure enough, once her travel cage was opened, Nielsen raced to the tree and joined her mother, Lona. Then the both of them moved to a fruiting tree nearby and started eating. 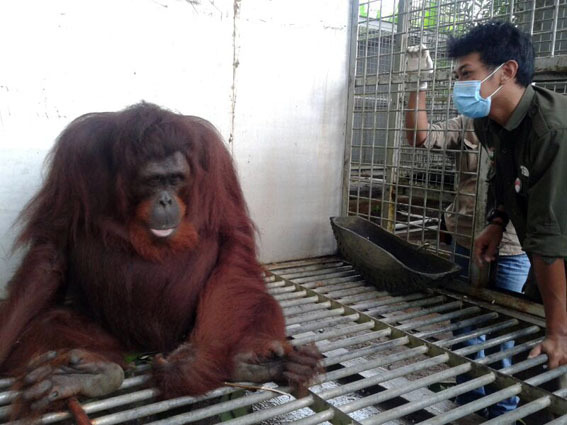 Mongki’s travel cage was opened by vet Adhy Maruli. 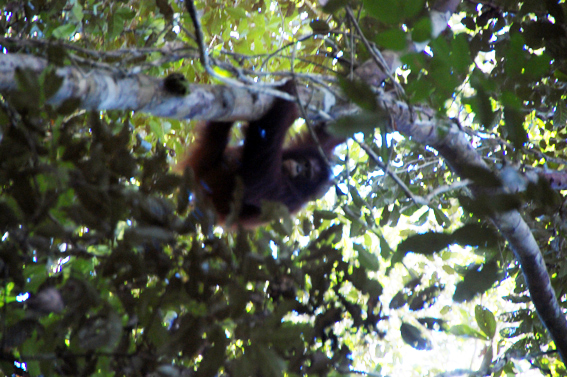 But Mongki didn’t immediately climb a tree. He didn’t seem pleased with the team’s presence and turned around to chase them to the riverside! The team boarded the ces (a small traditional long wooden boat) and moved a bit further but still at a distance where they could see Mongki. Mongki sat at the riverside as if ensuring that no one came back. 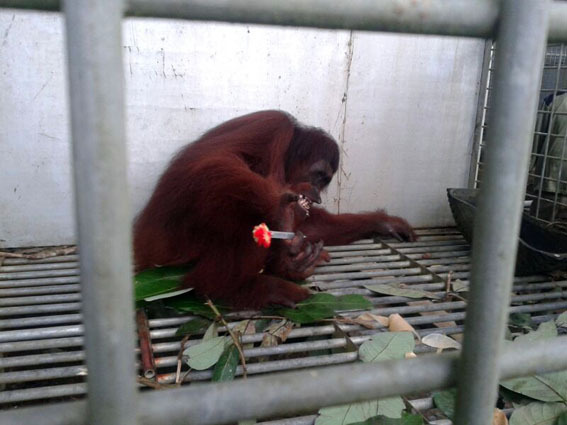 But the team persevered because they still had to retrieve Mongki’s empty cage and return it to Nyaru Menteng. When Mongki went into the forest to approach Uban’s travel cage that was yet to be opened, the team got a small window of opportunity to quickly grab the empty cage and put it on the ces. 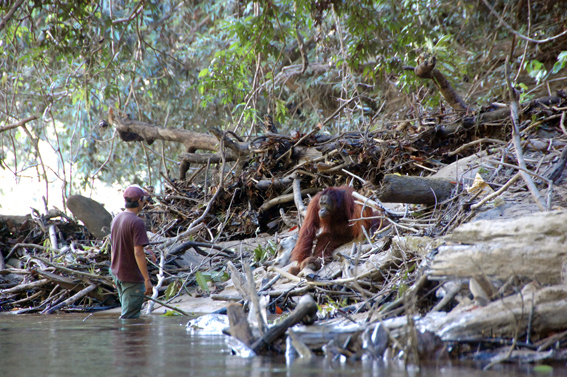 Soon enough, Mongki returned and sat again by the river to watch the release team. Two technicians managed to avoid Mongki and went to Uban’s travel cage. Technician Hendra Wijaya swiftly opened his cage. 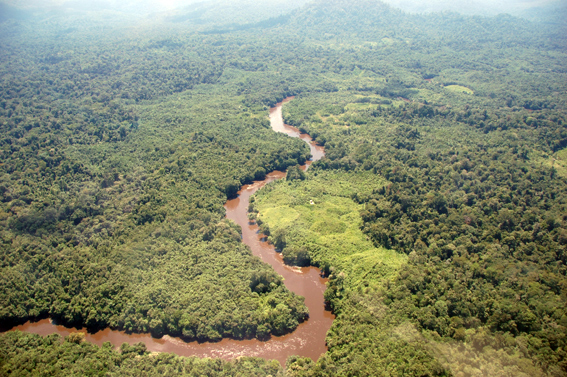 The team hoped that Uban would encourage Mongki to move away from the riverside and enter the forest. 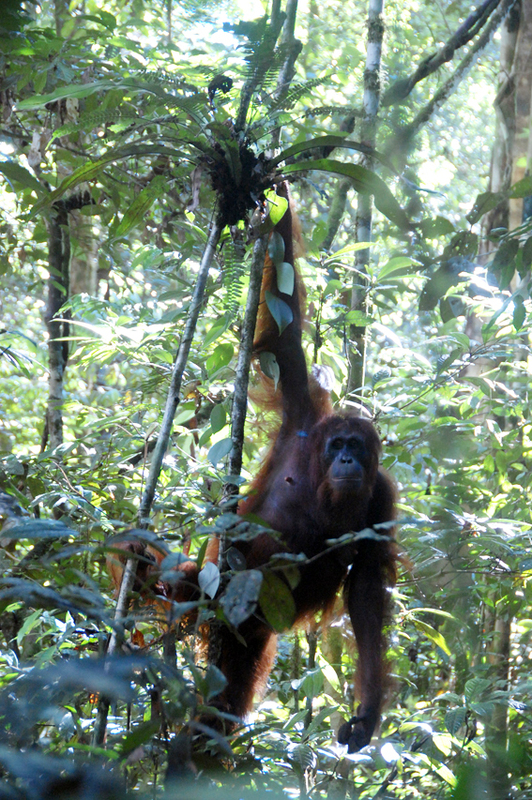 But just like Mongki, Uban too did not immediately climb a tree. Instead, he grabbed his cage and rolled it around. Maybe like Lulu, Uban also wanted to make a statement that he will never live in a cage again. Once satisfied rolling his cage around, Uban approached Mongki. The team slowly moved Uban’s empty cage away from him. But Mongki saw them and started to chase again. He also seemed to be bothered by Uban’s presence. 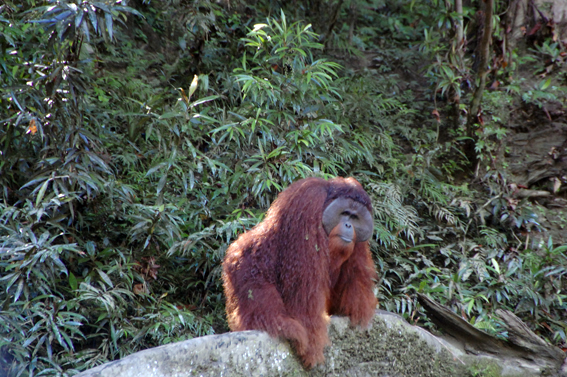 Mongki then sat on top of Uban’s cage while Uban sat on a tree trunk, also by the river. The rest of the technicians could only watch helplessly from the other side of the river while the two remaining technicians were trying to avoid Mongki. But they caught Mongki a little off guard, and finally managed to get the cage, then quickly moved to the river and jumped in the water. Apparently Mongki doesn’t like the water so he stopped his chase. The technicians immediately put Uban’s cage on the ces and all team returned to camp feeling relieved and happy that all orangutans are now free! 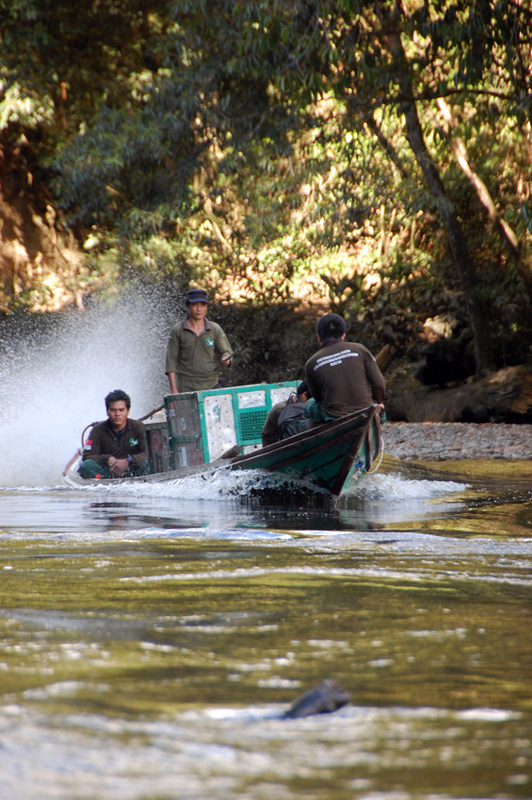 The orangutan release activities for this month have officially ended. Updates on the last four orangutans who were released today will have to wait for some of the team members to return from Batikap at the end of this month. But judging from the returned empty cages, it is clear that Monmon, Bonet, Ubai and Tehang have been successfully released. This weekend event also coincided with the Indonesia’s 68th anniversary of freedom and independence. Inadvertently, it also coincided with the World Orangutan Day that will be celebrated worldwide tomorrow on August 19. Happy Independence Day, our beloved orangutans! And Happy World Orangutan Day! Hi Loretta.. We will try our best to give you all updates on the orangutans.